Click me for a bigger view! That’s the Roses Flogger by Ruff Doggie Styles, and it’s absolutely divine. We’ve owned two other floggers by Ruff Doggie Styles, and we hated the way both were made. The leather was cheap, and stiff. The floggers were light and felt almost fragile. So when Rayne looked at the manufacturer of this toy, after asking to review and give it away, she got a little nervous. The second the flogger was in our hands, though, the nervousness faded away. The handle is nine and one-half inches long. It’s wrapped in tightly woven red leather in the center, and the two ends are wrapped in tightly woven black leather. Protruding from the black leather on the end is a woven leather wrist strap. There are a couple flaws in the weave on the handle. But you have to really look to see them. They don’t detract from how nice this flogger looks at all. The nine falls are twenty-four inches long. They’re a little uneven, but it’s hardly noticeable. They’re black, rope-like woven leather, each about a quarter of an inch thick. The ends of the pieces of leather used to weave the falls are cut into points, left to form the leaves found beneath the bud, and tied off securely by what appears to be another piece of leather, but we could be wrong. No way are we taking this gorgeous thing apart to find out. 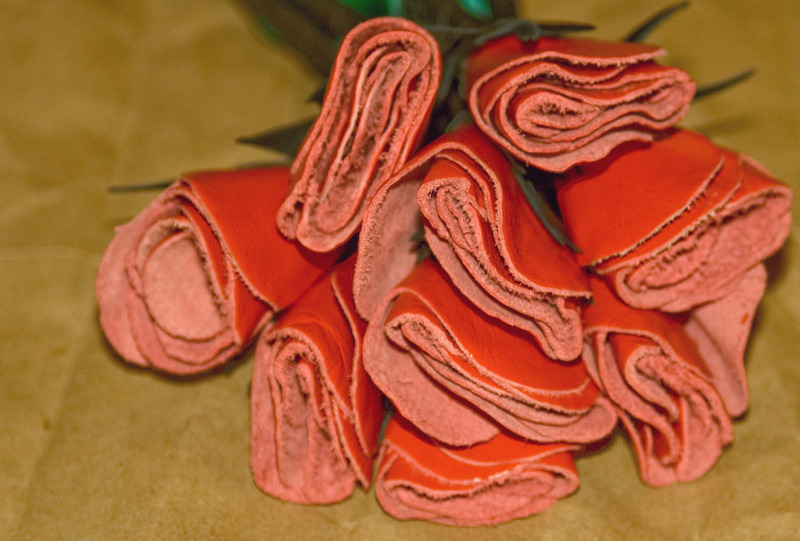 At the end of each tail is a rosebud made of five pieces of red leather cut into petals and wrapped around each other. Each bud is about two and a half inches long, and an inch and three quarters long. When the flogger came, they were squished flat, and Rayne tried to fluff them, but using the flogger flattened them again. Strung along the falls are green leather leaves printed with… We call them veins. They’re probably called something else, but to us, they look like veins. Because the leather is flimsy and wrinkly, we had to look really closely to see them, but they’re there! This is the longest, heaviest flogger I’ve ever used. 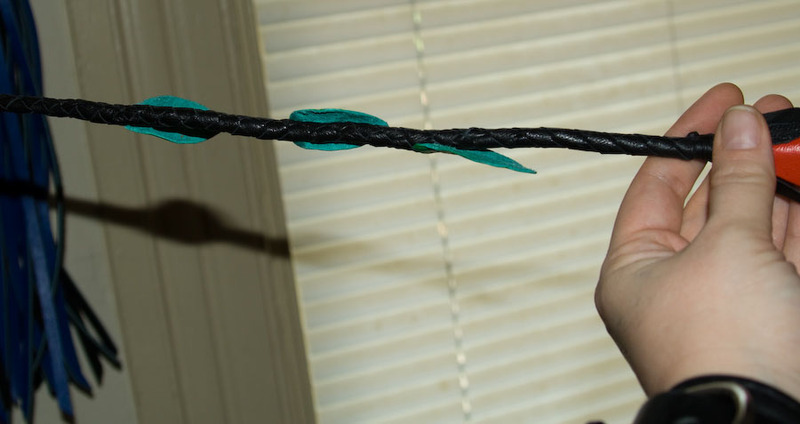 While I’ve been using floggers for a long time (Rayne’s still trying to talk me into videotaping a session. Soon! ), this one’s taking me a bit of getting used to. The material is supple and of decent quality. The handle’s a little on the light side, but it doesn’t really affect the flogger in use as much as I expected it to. The falls have a tendency to get tangled on occasion, but all the roses pretty much fall in one clump anyway, so it doesn’t affect how the flogger performs. It will be exceedingly difficult to find a strength to swing this at that is too much for a thud-lover. Yes… It’s that good. So unless you manage to find this flogger’s bite, you’re gonna be swinging a good long time before your bottom calls red. Unless they’re more into lighter play, I suppose. But even that’s easily controlled by an experienced flogger wielder. That’s the only complaint I have, though. I wish the roses were maybe a little smaller. I feel like I’m throwing a Mac truck at rayne every time I use it. The leaves in the tail. It’s like being punched. Though, wouldn’t you know it, M’s figured out how to make this thing sting. Brace yourself for the first blow, cause this baby almost knocks me off my feet if M gets any bit of power behind it. It’s heavy, and delicious. It seems to be well made. And it was definitely made with a thud-lover in mind. It doesn’t really smell like leather, which was a little bit of a let down. There’s something to be said for that savory animal smell that wafts off quality leather when you take it out of the flogger bag. But how it feels in use really makes up for it lacking in smell. But let me tell you, I love this thing. It is my new favorite flogger. None of the other ones we’ve owned can produce this amount of thud. Thanks, Eden! Store this flogger somewhere dry and flat, or hang it on the wall. If you must, use a damp cloth to clean it, or something more suited to leather like saddle soap, and be sure it dries completely before you put it away to prevent mold. If you’ve never used a flogger before, practice on something inanimate. A chair, a couch… something that’s not living and breathing. Wouldn’t want to take an eye out. When you feel comfortable with that, try knocking the head off a rose. Till you can do that without knocking over the vase, you need to stay away from humans. But seriously, test out the weight and your aim before swinging this flogger at someone. Its design can (and probably will) throw off even the most experienced top at first. Unless you’re used to swinging things that are heavily weighted at the end and super long. That store sent us this toy in exchange for an honest review, but you can pick it up at Pink Cherry. I’ve not had the chance to explore this type of play, but I think I could enjoy it very much. This is a great review, thanks for linking me!